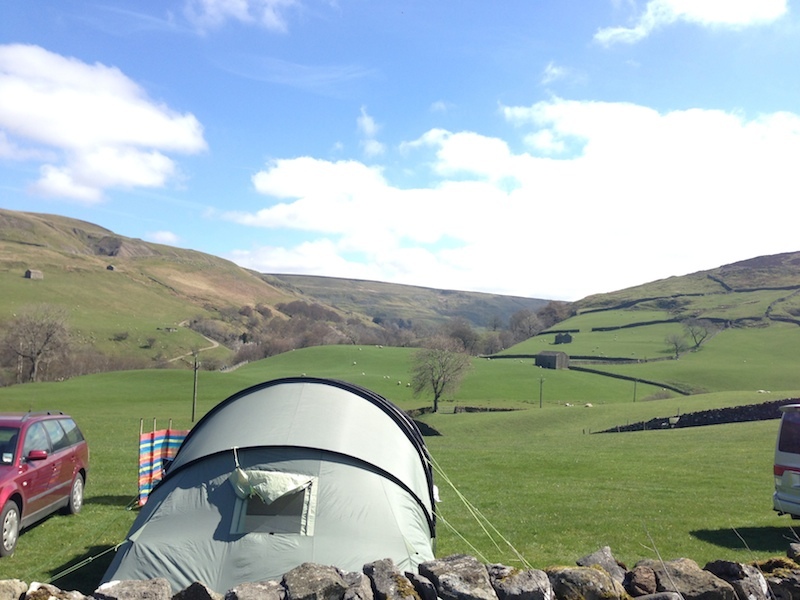 Our campsite by the River Swale offers you the chance of a peaceful relaxing break. There are lots of picturesque waterfalls on this stretch of the river. We also have a site which has a panoramic view of Kisdon Hill and the valley down towards Muker. We have a small farm teashop providing hot & cold drinks, sweets, ices, light refreshments, basic provisions and a very limited off license. The site has toilets with hand washbasins offering hot and cold water, two hot showers that are free to use as well. There are washing-up facilities but unfortunately are no laundry facilities. We have no mobile phone signal within 4 miles so come and enjoy the peace and quiet. There is a car parking area for people wanting to leave cars overnight or for a few days while they go off walking. Generally it is fairly quiet through the week. It can be quite busy on a weekend but there is plenty of space. The site can get very busy over the bank holiday periods so I’m afraid no guarantee of a pitch but we do try to accommodate anyone who comes. Very sorry but we don’t take any bookings for the site or for the hook-ups. We also don’t have facilities for card payments, so only accept cash or cheque (made payable to Mrs B A Rukin). As Park Lodge is very much a walkers/family site, we ask those staying to be quiet by 10.30pm and not to play music after 10pm. No loud music at anytime. Some of our campers are overnight walkers doing the Coast to Coast, Pennine Way , Herriot Way or just passing through. Children tend to like our riverside site so they can play in the river but its only 5 mins down to the river from the other field with plenty of areas for paddling / swimming. We are situated on an ideal stretch of the river for kayaking (but only when there has been sufficient rainfall). Keld is a small village and very much a walking area and there are many walks straight from the site, short or long. The site is open from Easter to the end of September.